ThemeShock WordPress Themes Review - Are They Good? 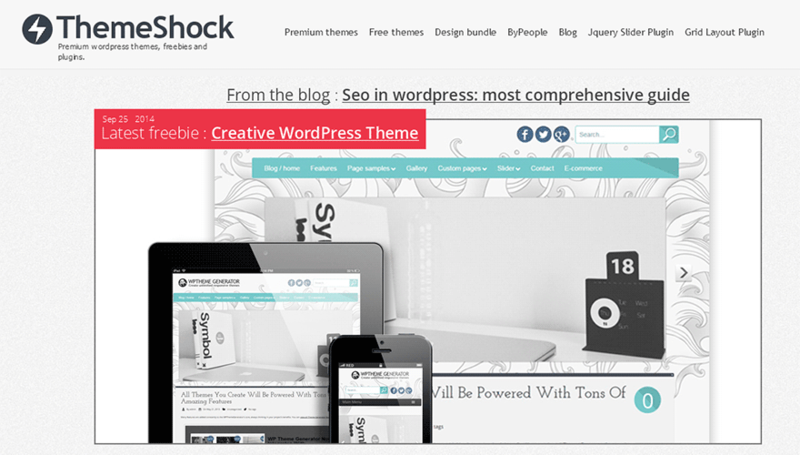 If you’re looking for a premium WordPress theme subscription service that has a lot of themes at a low price and which releases a ton of theme updates, you may be interested in WordPress Theme Shock. The company offers an extremely good value in terms of cost per theme, which is ridiculously low. Support options are somewhat lacking, however, which is a drawback which reduces our overall rating of the company. Read on to learn more about what they have to offer. Their prices are extremely low allowing their customers a fantastic cost-per-theme ratio. The biggest downfall that we found with Theme Shock is their lack of a customer support forum. We feel they are following a quantity over quality model. WordPress Theme Shock is based in Columbia and was founded in 2010. Their PR is 5, which is lower than a lot of other theme clubs, but they do receive a substantial amount of traffic. They are pretty popular for this reason, and they do have a lot to offer for a low price. At the most basic level, you can get the full developer package for a single payment of just $39.00 with no recurring fees. This gives you access to more than 212 themes and also allows you to download and use all new themes as they are released. The company releases a new theme at least once a week, which is much faster than most companies which create WordPress themes. The package includes numerous icons you can use for social media, iPhone applications, and more. There are more expensive packages available which contain additional professionally created icons. You also can add the Theme Generator to any package for $19.00 a year. This offers you advanced customization so that you can create new themes on your own. The site has an innovative way of showing off its current theme collection. If you click the link to “Premium WP Themes,” you will see a page that tells you about customization options. You can re-skin the page however by going to the top and choosing, “Select Another Theme.” This will show you the actual themes by changing the way the information on the page is displayed, modifying the backdrop and arrangement of the design elements and so on according to each theme-so you can literally experience the themes as you learn. All themes are responsive. They are of a high quality, although we have perhaps seen more impactful and varied themes elsewhere. There are numerous layout options available for design elements on the page. You are also given a number of icons, templates, and more you can use as part of the Shock Bundle to make your site eye-catching. You may change the aspects of any of the design elements on the page and modify menus, backgrounds, buttons, textures, and more through a simple design interface. The single biggest drawback of the WordPress Theme Shock Bundle is the lack of a support forum. Other support options are fine-full documentation, video tutorials, and other learning materials are provided, as are a blog and social networking sites for updates. An email/ticketing system is available if you have problems and need someone to help you out, but there is no support forum which allows you to discuss your issues with other users and administrators. That makes it significantly harder to get answers to questions, particularly common questions other people may have asked in the past.